Who needs Mario Kart when you've got Hello Kitty Kruisers? 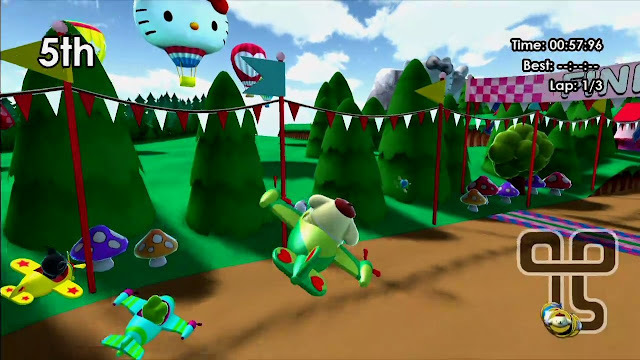 I mean, sure, Mario Kart has tight, precise racing, gorgeous tracks taken from decades of kart racing expertise, and dozens of characters to choose between, but Hello Kitty Kruisers has boats and planes and Cinnamoroll. There's just no competition there. Mario Kart got blue shelled right on the finish line. Not quite, of course. 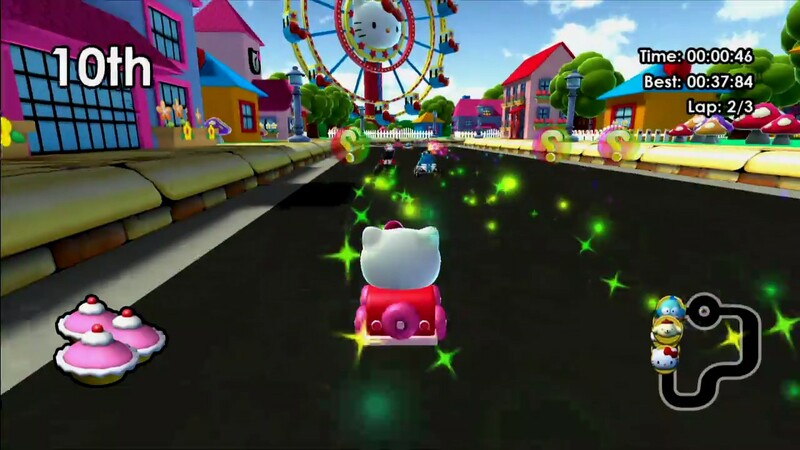 Of course Hello Kitty Kruisers is a completely uninspired and cheap game that is designed exclusively to capitalise on the unending popularity of Sanrio's stable of creepily cute characters. It works (and you'd hope so given that this is a port to the Switch from what was apparently a popular enough Wii U title), but if you're actually looking for a kart racing game, and you choose this over Mario Kart, I look forward to seeing you in one of the truly terrifying Hello Kitty stores in Japan next time I'm over there. Oh my dear Miku, the colours and bubblegum kawaii everywhere. There's just no escape in one of those stores. I digress. But (and you all knew I was working towards a "but" here, let's face it), there is charm to Hello Kitty Kruisers. Mostly because those Sanrio characters really are so frighteningly cute. They'll terrify you, but you'll also find them oddly compelling... and then the next thing you know you really will find yourself playing this rather than Mario Kart. Especially if there's a young one in the home. For those of you who don't know much about Hello Kitty (and if you're reading this Japan-focused site and don't know about Kitty, then you must be new, so hi! ); Hello Kitty is the design of a company called Sanrio, which specialises in producing a wide range of cute characters. No, really, that's really what the entirety of Sanrio's business model is. In Japan, people love mascots. They infuse every part of Japanese life. There are mascots that represent Japanese sports teams. There are mascots that represent every town, city, and prefecture. There are mascots that represent disaster warning systems, and there are mascots that exist just for the sake of existing, such as Hello Kitty. There are endless sociological reasons that the Japanese are so attracted to the idea of a character mascot, but it really is such a part of everyday life over there, and it adds colour to the country; every time I come back to Australia from a trip to Japan one of the things that I find so different is how comparatively bland and colourless this country is. And so Japan has companies like Sanrio that make massive profits by simply creating characters and licensing them out. Kitty has been the most effective of these mascots; everywhere you go in Japan you can buy Hello Kitty licensed products, on everything from food to whitegoods, souvenirs and then videogames like Hello Kitty Kruisers. It's a bit like how in America, Donald Trump's name is on everything from hotels and casinos right through to universities and steaks. Only Hello Kitty isn't a lobotomised orangutan and even when she's at her worst, her name commands more respect than that trashfire's. Kitty has also been around for long enough now that her fans range from the very young, right through to middle aged people. Many older people have made a hobby of collecting Hello Kitty charms that represent every region of Japan, for example. 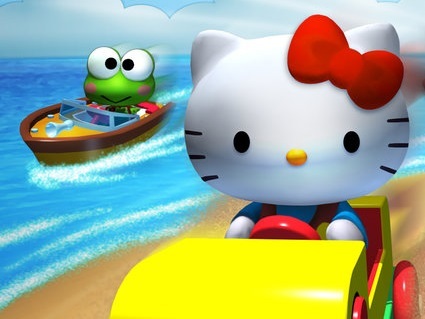 Which is why it's a little odd to me that Hello Kitty Kruisers is pitched exclusively at a young audience. This game has clearly been designed so that a three year old can play and enjoy it, and that's fair enough, but generally speaking the very best games (or television/ films/ whatever) for children also offer something for the parents dragged along for the ride as well. 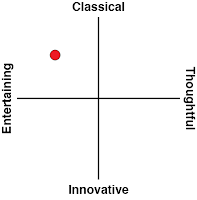 Whether that's some adult humour that wouldn't register with a child, or a game like Mario Kart where there's enough to it that kids can have a blast while adults learn its intricacies, the general idea is that if both children and adults are having a great time, everyone wins. Kitty's super-basic track design, sedate pace, and general ease of play all mark it out as a game for the younger players, but there are no advanced tricks, short cuts, or competitive opportunities to really inspire older players to get more out of it. There's multiplayer, so it's possible for parents to play with their kids, and that's great, but the downside to this approach is that while even the youngest players can really enjoy their time with it, ultimately that shallow nature means that replay value is limited even for them. And that's a pity, because the game does a really good job of representing Sanrio generally. The roster represents many of Sanrio's most popular faces (Kitty herself, of course, but also Cinnomoroll, Tuxedo Sam, and Kero Keroppi). Environments are bright, colourful, and charming, in the same ultra-kawaii manner that hits your eyes like a sledgehammer every time you walk into a Sanrio store. There's also plenty to unlock, and a mission mode that helps add replay value to the whole experience. 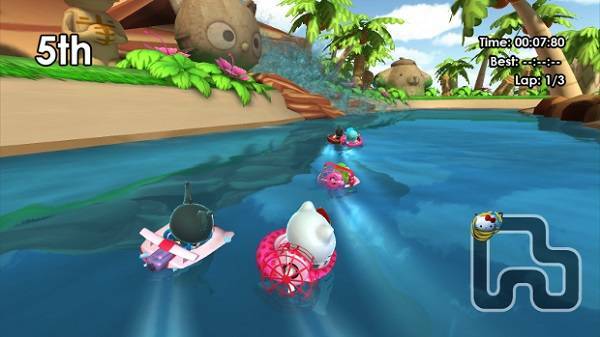 Hello Kitty Kruisers is also fun, as far as its limits and very minimalist manner allow. As with every kart racer there are weapons and other items to pick up, from pies to throw at opponents to a rainbow that will zip you through the ranks. Yes, the cars aren't exactly racing along at a pace that will get the adrenaline running, but it's smooth and clean, and there's just enough in tracks with speed pads and the like to keep you concentrating on what's in front of you. I imagine children will also find it challenging enough. I didn't observe what could be called "rubber-banding" AI, where the AI opponents all magically manage to keep pace with you, no matter how well you race (thanks, Mario Kart), but I've been playing these kart racers most of my life, and I even managed to lose one or two races along the way. So the target audience will probably also enjoy the challenge of trying to come in first in all the races. 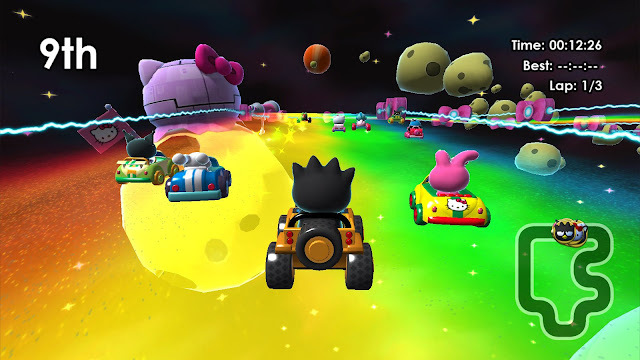 So, yes, Hello Kitty Kruisers isn't a great game from an adult's perspective, and that's a bit of a wasted opportunity as there are plenty of adult Kitty fans out there. 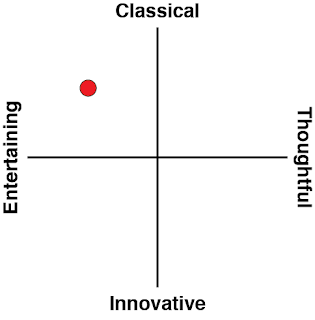 But where most games made for children are brutally bad, I don't think Kruisers is that. In fact, I think the developers have cleverly stripped back the elements of a kart racer that children struggle with, while leaving the elements that they're inclined to enjoy. And for parents that are dragged into playing this with their kids, just think; soon enough they'll graduate to Mario Kart. And in the meantime I'll wait for a San-X racer, because as cool as Cinnomoroll is, Rilakkuma is and forever will be the A-tier mascot God.